Sitting at a desk for eight hours is rough on your body. Our posture can’t be perfect for that long, we don’t get up to stretch enough, and we spend most of the day craning our necks and putting our wrists at harsh angles trying to get comfortable. Even if you are lucky enough to move your work from place to place, there’s still a good chance you’re not going to sit the way you should. Standing desks are becoming more and more popular, but they’re rather stationary. You can’t just pick up your whole setup and carry it with you. Unless of course, you have the Zest Desk. 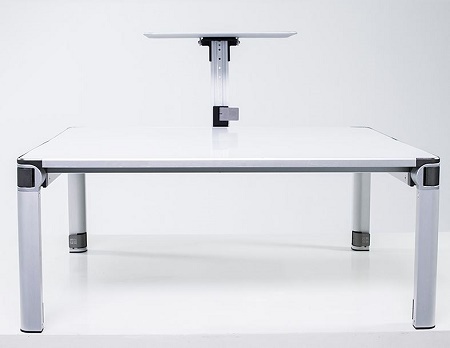 This is portable, adjustable, and can turn any table into a standing desk. Made of a high-quality aluminum, this can take everything from a laptop to a mega-monitor and more. The top shelf can hold up to 24 pounds, while the bottom table can support 44 in total. Of course, you will have to deal with carrying around a 12 pound desk with you at all times, but it does come with a carrying case. However, supporting that much weight if you move around frequently may provide different aches and pains. This is a $386 purchase that will hop up closer to $663 when the pre-ordering phase has run out. It seems as though your specific situation will weigh greatly on whether or not this is a solid option for you.